Filled with wit and wisdom, Betsy Singleton Snyder’s tales of parenthood are ones all moms can relate to. 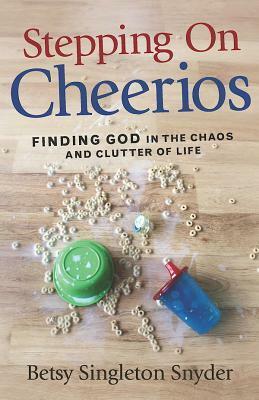 I enjoyed the observations found in Stepping on Cheerios, as Snyder shares her thoughts and experiences of finding God and grace amid everyday living. As she says, “Family life is beautiful and motherhood is a privilege, but it ain’t no picnic!” Child-rearing is challenging, and it is great to read stories from one who knows and understands both the blessings and misadventures of motherhood. Join Betsy in celebrating a crazy life of motherhood and her new book by entering to win a $75 Visa cash card! Enter today by clicking the icon below, but hurry! The giveaway ends on June 27. The winner will be announced June 28 on Betsy’s blog. Independent and self-sufficient, author Betsy Singleton Snyder lived a full and busy life as a pastor, missionary, and wife to a husband who served in the U.S. House of Representatives. She had her first child at age 44, then at 47, she found out she was carrying triplets. Suddenly finding herself overwhelmed is an understatement. Stepping on Cheerios is a collection of funny, warm, and charming tales from the frontlines of parenthood, written for women who are juggling to accomplish everyday feats of work, motherhood, marriage, church, and more. It’s a comical story of one woman’s realization that her crazy life is a gift and how she found the grace in it. Visit the blog tour landing page. Learn how God’s imprint on your heart can make a lasting impression on your children. Being a mom usually means being busy. Really busy. Whether you’re zipping from your children’s piano lessons to their next ballgame or nursing a baby while comforting a toddler, life is brimming with activities. Yet one encounter can help shape every moment: time in the Word with Jesus. In Walking with God in the Season of Motherhood, you’ll learn how to nourish your own heart, mind, and soul with the wisdom you need to become the mother you long to be. What a wonderful devotional! 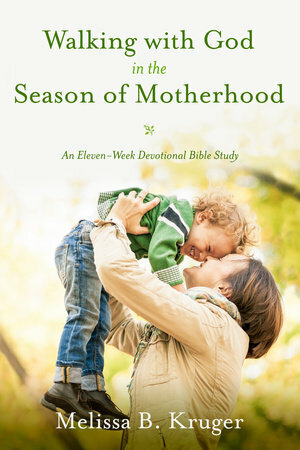 Walking with God in the Season of Motherhood is an eleven-week devotional Bible study that will encourage you as a mother and as a child of God. In the busy days of motherhood, we often fail to set aside time for our own spiritual growth and strengthening. This book is specifically tailored for mothers and each week offers four days of Scripture study and a fifth day of reflection and application. I really enjoyed each lesson and loved that each Bible passage was included in the book for convenience. I also enjoyed Kruger’s own stories of motherhood and words of encouragement. Other helpful resources include verses for memorization for both mothers and children, as well as a study guide to use in a group setting. I loved Walking with God in the Season of Motherhood! Melissa Kruger has written an encouraging study that I will use again and again. I received a complimentary copy of this book through Blogging for Books and appreciate the opportunity to offer my honest opinion. Melissa Kruger teaches women at Uptown Church in Charlotte, North Carolina, and at conferences around the country. She regularly writes articles for the Gospel Coalition and Christianity.com, and she is the author of The Envy of Eve. Melissa’s most cherished roles include being a wife to Mike, president of Reformed Theological Seminary–Charlotte, and a mother to her three children, Emma, John, and Kate.